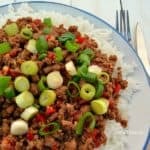 Korean Beef is a 20 minute, easy recipe – serve over rice, or in lettuce leaves Korean Beef is one of our favorite dinner recipes, especially on a busy week day or when I need to use vegetables grown in our garden before it goes bad. 20 Minutes is all you need to get this Creamy Bacon and Mushroom Spaghetti on the table ! 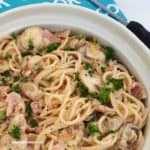 Recipe yield 8 adult sized servings [can easily be halved/doubled] Creamy Bacon and Mushroom Spaghetti is a quick, tasty and very filling dinner.